Craig Capurso isn’t your typical bodybuilder. Craig has the smarts to train and eat at expert levels. Follow his nutrition plan and you can corner the market on fitness. This may sound devious, but the only way to keep pushing toward your goals is to trick, lie, confuse and confront your body. To do this, you must first know how your body currently operates, and how you want to see it change. Craig Capurso, the winner of the 2012 Bodybuilding.com Spokesmodel Search, asks you to ask yourself two questions that will help define your transformation. Am I a skinny person who wants to get bigger? Am I a bigger person who wants to be smaller? How you answer this determines your diet. To lose weight, you must eat fewer calories every day than your body requires to maintain its current weight, even if that means giving up a few indulgences. You may need to eat more to lose weight, if your metabolism isn't running at full steam. To gain weight, you must eat more calories than your body requires to maintain its current weight, even if you have to force food down. "Don't be too aggressive," Capurso said. "You want to make sure it's adjustable. Educate yourself. Find out what a good carb source is. Find out what a good protein source is. There are good fats!" Human nutrition is not a simple subject. 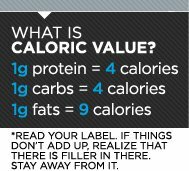 Every body has its own unique properties, but calorie management is an absolute must. Changes don't occur immediately, but they will come, and that's what really matters. "When you're dieting or when you're doing nutrition, stress less," Capurso said. "Think about adding one stress at a time. Change your diet first, then you're going to change your calories. Then change the way you carb-cycle, calorie-cycle, whatever it is you're going to do." Capurso's rigid diet got him into trouble at the NYMEX for bringing food onto the trading floor; he was smuggling chicken breasts in his chest pocket so he wouldn't miss a meal. Champions pay the price… a $250 fine. Craig said he cheats more in the offseason, because he's trying to put on mass and the extra calories help, but in-season dieting is different. He still cheats, but when he's eating around 50 meals each week, one or two cheats don't make much difference. "People have to live, and enjoy those little spices in life," Craig said. "Treat yourself to a cheat meal. Reward yourself for eating right 90 percent of the time. Enjoy it!" Craig puts his diet into an Excel document, which totals all his macronutrient data, so he can make slight adjustments and see the totals change. See kids, math is fun! "I have been one of the guys who gave himself an off-season when not competing. I would consume nearly anything my body craved. As I have grown in this sport, I have become more of a "Fitness Model." I stay leaner year-round to maximize the opportunities. My take on nutrition is to eat healthy 85% of the time and indulge your cravings 15% of the time. It's great to look good, but if you sacrifice everything, you aren't doing a whole lot of living.